Ø Troop 215 has an open invitation for Webelos and their families to take part in our camping trips. If you are interested in sharing a camping adventure, please contact us. Ø Troop 215 leaders are available to make a fun presentation to your Webelos Den to prepare them for the Boy Scout program. Ø Troop 215 can provide Den Chiefs to help Webelos Den Leaders increase the desire of Webelos to continue in the scouting program. 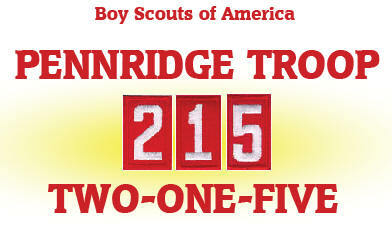 Ø Troop 215 will arrange for Webelos Dens to visit and take part in a regular troop meeting. Our leaders accommodate special needs for all Scouts in a private and discrete fashion. New Scouts are assigned to a special "Dan Beard Patrol" where they receive the help of a dedicated adult leader and special program features targeted to provide them with a "jump start" in the scouting program. New Scouts are integrated into our program in a fun and non-intimidating fashion. "Older Buddies" are assigned to each new Scout to serve as their guide to Scouting. Our "No Bullying Policy" encourages teamwork and support for fellow Scouts in the troop. Troop 215 looks at the big picture! We do not focus on mistakes or have a punitive environment - that's no fun! Both Moms and Dads are enlisted in leadership positions. Our troop atmosphere has a strong family element. Webelos parents are invited to attend out adult committee meetings, so they can get to know the committee before their son bridges over to Boy Scouts. Mr. Dave, our Scoutmaster, also serves as the Tohpendel Assistant District Commissioner for the Cub Scout Program. Several of our adult leaders also hold important leadership roles in area Cub Scout packs. Troop 215 has a mission! We aim to bring your son to his highest potential with an adventurous program that uses positive peer pressure to build character. Troop 215 has a program! Our unique program "Adventures in Scouting" is designed to make scouting so much fun that a boy would never want to leave the Scouting program.